Summary: They don’t call us sharks for our ability to swim. BUM DEAL is the 13th and maybe final book in the series featuring Defense Attorney Jack Lassiter as the main character. Lassiter is an ex-Penn State/ Miami Dolphin linebacker who earned a law degree in night school after his playing days and suffers from early symptoms of Chronic Traumatic Encephalopathy (CTE), a degenerative brain disease associated with severe head trauma. Lassiter, now 50 years old, is a tenacious defender of his clients and often crosses the line between proper and outrageous behavior in the courtroom. In BUM DEAL, Lassiter reluctantly switches sides and becomes a special prosecutor for the District Attorney in a high profile murder case against Clark Calvert, a famous orthopedic surgeon accused of killing his missing wife. The problems Lassiter must overcome in his case against Calvert are that there is no body, no evidence and no witnesses. To compound Lassiter’s challenges, Calvert has hired his two best friends, Steve Solomon and Victoria Lord, as his defense team. Lassiter has been a mentor to these two and they’re well-versed in his courtroom tactics. Author Paul Levine does a fantastic job of bringing this story to life. His characters are well developed and the interplay among characters is very well done. Levine’s prior experience as a sports writer at Penn State, allows him to add real-life detail to Lassiter’s playing days at Penn State and in the NFL. His knowledge of CTE is evident in the ways he describes Lassiter’s behavior as it relates to memory loss, irritability and confusion. Even though Lassiter’s best friends are his adversaries in this case, there is still plenty of witty remarks among the three. Levine adds a complexity to the storyline as he reveals a prior history between Valerie Lord and Calvert which could complicate her defense tactics and roil the relationship with fiancée and partner Steve Solomon. The case is further complicated when the District Attorney brings a political element into the proceedings when his biggest donor for his campaign for higher office happens to be the father of the missing wife. The courtroom scenes are very interesting and when Lassiter has his back against the wall, things get really bizarre. Even though this is the 13th story in the Jack Lassiter series, there is no need to read any of the prior novels to follow the storyline and characters. BUM DEAL is a fast-paced easy-to-read novel that will keep your attention up to the end. Levine seems to lead the reader to draw certain conclusions and then shakes things up with a surprising conclusion. 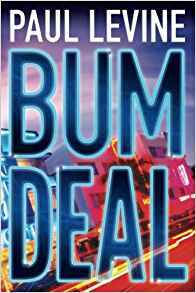 Anyone interested in the legal thriller genre will really enjoy BUM DEAL. Thanks to Booking Pap Pap for his review and thanks to Saichek Publicity for providing a review copy of this novel. Oh yeah, I'm sure the PSU connection makes it more entertaining. It sounds like a series I need to try.